You're not going to believe this story. We're warning you right now, even before we begin. This is - without a word of a lie (which we know is not our usual modus operandi - and neither is putting latin in italics) - a tape we'd been trying to find for some time. And where did we find it?In Jett Thunders' living room. We're not making this up. Seriously. We were at Jett's house, and he was in the bathroom fixing his hair or something, so we were being nosey, as we are wont to do. And when we saw a small pile of tapes, we figured the best we were going to find was a copy of Appetite for Destruction, or maybe Pornograffiti. So imagine our surprise to see this tape!We know that we've lost you here. You can't fathom why this tape is so important. 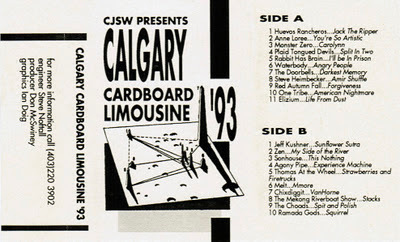 For us, this is one of the better Calgary compilations from the 90's, bringing together Huevos Rancheros, Agony Pipe, the Choads, Rabbit Has Brain... Sure, there are a few bands we can't seem to remember (Thomas at the Wheel? Mekong Riverboat Show? ), but there's at least one song we're really excited to hear again - the Steve Wynn-esque "Carolynn" from Monster Zero, featuring Walter Porochnuk, Don McSwiney and Pat McGannon (the latter two of whom would form the Manhattan Jump Blues Revue/Dino Martinis). Oh, and more Ramada Gods. This is a well put-together compilation, despite its lack of liner notes or extra documentation. A great snapshot of a moment in time. 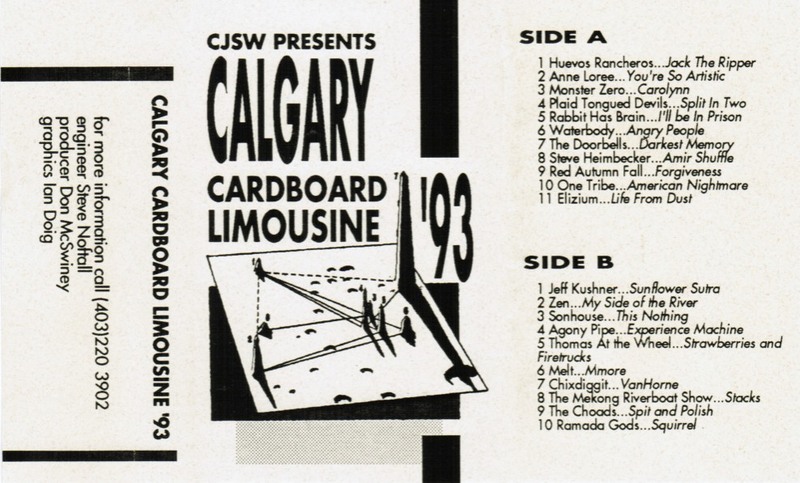 Little touches like this are why we pledge to CJSW every year. So make sure you've paid your pledge and then grab this. Mekong River Boat Show later become I Care. And their singer Doug Wurzer went on to sing for Showdown 76. Had no idea we (Agony Pipe) were on this comp. I'm looking for that tape recently... How lucky you are to find it! It sounds like you have found your treasure, right?